Describe factors and groups that influence school curriculum. Track historical trends in school curriculum. Understand and apply curriculum development processes. 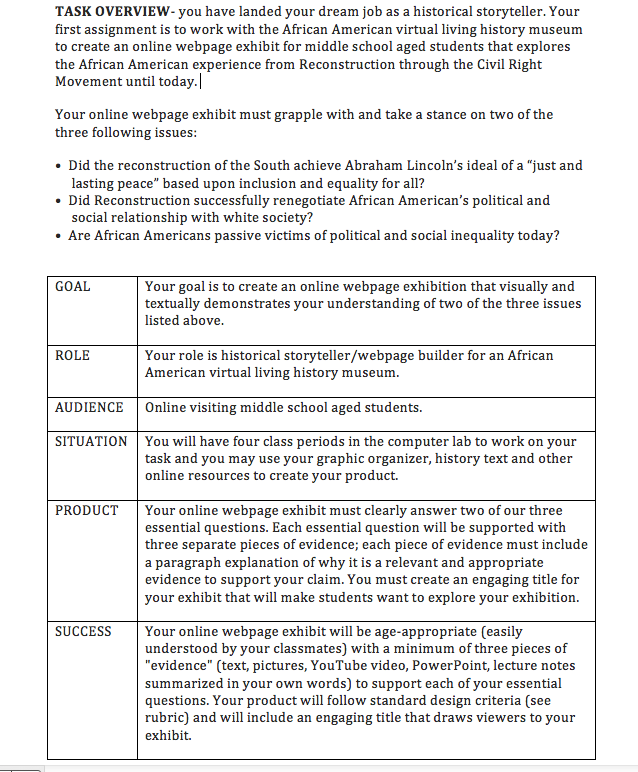 I will address each of these objectives in due course but first want to begin by reflecting on our first assignment, creating a curriculum resume. I have to admit that I was baffled at first. A curriculum resume I wondered? Initially, I didn’t think that I would have any experiences from which to draw, but once began I quickly realized that I have indeed, written a lot of curriculum. It seems that in nearly every teaching position I’ve had, I’ve gone in and completely rewritten the curriculum for a variety of reasons. The year I taught Grade 8 US History, the district adopted a new text. I spent time creating units that incorporated the text with materials that I developed on my own; I had student taught in the same school and was eager to infuse the curriculum with my ideas and resources. When I taught Grade 5 in Mongolia, the filing system of teacher’s past was archaic; boxes full of “stuff” coupled with a lack of standards helped me determine it was easier to start fresh then try to figure-out someone else’s thought process. I encountered a similar scenario in Bolivia; file folders crammed inside a bulging filing cabinet with no real rhyme or reason. Again, I was left with a legacy of weak curriculum (and unhappy parents) so rewrote the entire middle school language arts curriculum. Along the way of rewriting all of this curriculum, I’ve discovered that although it’s a tedious and time-consuming process, I love putting together a unit; I revel in seeing how the pieces fall together, finding engaging (and relevant) online resources while luxuriating in the intellectual challenge of matching learning targets to assessment. My Curriculum Resume details the various schools and resources I’ve used beginning with my first experiences teaching in Egypt (pre-certification) to the Applied Behavior Analysis focus I was using with two early learners with autism. However, the one dull surface on this otherwise shining love affair with curriculum development was the “Standards” with a capital S. You see, I never really felt like the curriculum I developed was an adequate or even accurate reflection of the standards. When I taught Grade 8 US history as a first-year teacher, I experienced the typical frustration of just trying to keep my head above water. I knew the time period that I was suppose to be working with and fell back on using my student teaching (same classroom, same content area) as my guide. I feel like I “covered” the standards but that I did not dig into them very deep. When I was in Mongolia, we didn’t truly have concrete standards until my second year; at that point, I spent hours pouring over the new math standards in an attempt to match them to our newly adopted text while weaving in additional resources. Surely, you ask, there must have been transparent standards at your school in Bolivia? Well, not really. I discovered halfway through the year that I was using an old version of the standards and these were eventually replaced as our department went through a year-long adoption process for new school-wide standards. My first blog entry Where Everybody Knows Your Name discusses the increasing sophistication of my understanding of…understanding. Wiggins and McTighe (2005) tells us that, “An understanding is a mental construct, an abstraction made by the human mind to make sense of many distinct pieces of knowledge” (p. 37). In this blog entry, I play with the notion that without utilizing the UbD design process, educators may unwittingly impart discrete bits of knowledge to their students without encouraging the development of a comprehensive and deep understanding that endures through time and across content areas. Our students may come to know bits and bobbles of disparate information but this does not create wisdom. Wisdom, I argue, is the goal and should take center stage of what education is all about. It is through the intellectual exercise of grappling with essential questions that students are able to begin building enduring understandings that they can apply in novel situations, then reflect on their learning process asking what worked or what didn’t work, and where can I or should I go from here? How do we know if students “got it”? Through the creation of standards-based performance task assessment where students are provided opportunities to apply their understanding in novel, real-life scenarios that requires active problem solving that communicates their understanding. This is what it means to be working through the Six Facets of Understanding in Bloom’s Taxonomy: explanation, interpretation, application, perspective, empathy and self-knowledge (Wiggins & McTighe, 1998, pp. 85-97). This is how our students gain wisdom. Given this mish-mash background in content areas and lack of experience building a curriculum around the standards, I began this course feeling a bit intimidated by the whole idea of curriculum design. Fortunately, as a Master of Arts in Teaching (MAT) student, my social studies special methods instructor introduced the Understanding by Design (UbD) design philosophy to craft the winter and spring work samples. While my UbD isn’t perfect, I felt it was important to focus on transferring my original unit into the Ubd format recommended by Wiggins & McTighe (2005). In this way, I was able to see what I had done correct and where the holes were in my original design; I was inspired by their example of a fictitious teacher engaged in the same reflective process. “Begin with an existing unit” (p. 258) is one of the six entry points recommended by Wiggins & McTighe (2005) when working with UbD for the first time. In my blog entry titled Did You Find What You Were Looking For? Self-analysis of a Resurrected UbD Unit I described some of the changes that I would make to my original design. I particular, I suggested a new GRASP performance task for my summative assessment with an acknowledgement that I would have to create new rubrics to complement my refined assessment. I found the process of creating the “Year at a Glance” useful for anchoring the rest of my curriculum map. By having a quick visual reference of the entire curriculum, I was better able to see the big ideas and topics that were embedded within my original individual unit designs but was not explicitly taught. 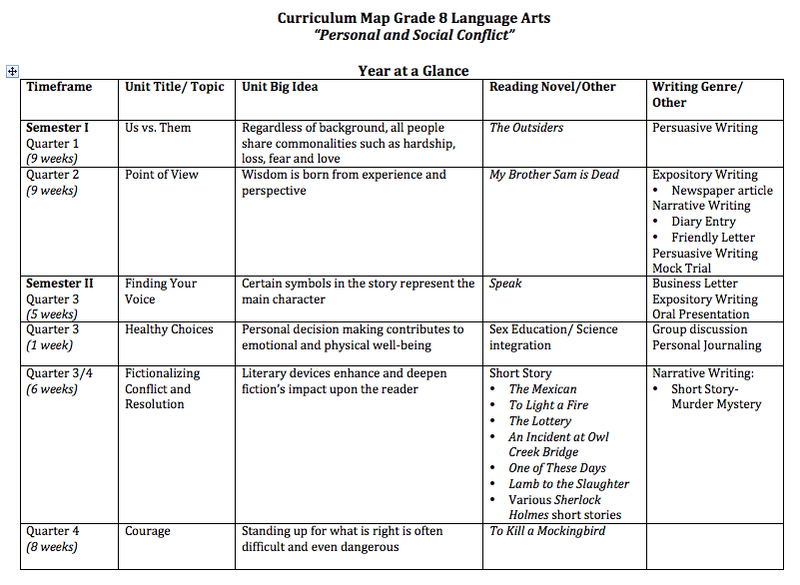 I envision using this portion of my curriculum map as a communication tool for students and parents to showcase the big ideas of the Grade 8 year and unit-by-unit focus. In particular, my topic Finding Your Voice through the novel Speak underscores what a complete UbD unit could look like in terms of a fully development formative and summative assessments including attached assessment rubrics. Needless to say, before beginning this project I was a little lost as to my starting point. I decided it would be a good idea to begin by spending time reading from texts that would help me gain a better understanding of who and what influences the school curriculum to gain a historical and current perspective. Although I did not work with an administrator on my curriculum projects, I recognize the value in collaboration and keeping “the bigger picture” in mind as individual teachers develop content area curriculum; if students are to see the bigger picture promised in the UbD design process, individual teachers couldn’t work in isolation. Also, as an inspiring program director, this text provided a coherent framework for what it could look like to work as part of an administrative team that works to move a school or district’s curriculum forward. An invaluable experience this quarter was time spent with a local curriculum director that works in the district office. I was able to spend about three and a half generous hours with her as she attended a weekly student learning meeting; this gave me an insider’s glimpse as to the intricacies both logistic and political of supporting teacher professional development and moving the district forward in a unified vision of education excellent. We had time to discuss what her job “looks like” day to day, discuss our educational philosophies and she shared various examples of her district’s curriculum maps to spur my thinking around my own project design. I think the big idea I took away from the experience was an affirmation that our students need to similarly be encouraged and provided like educational experiences to support their development and growth. When I was in high school, I never once had a class that supported my exploration of future career aspirations; this is where relevancy and real-life experience could be infused in our students learning. To better flesh out my understanding of the Common Core, I read from Pathways to the Common Core: Accelerating Achievement by Calkins, Ehrenworth & Lehman (2012). I found this resource to be invaluable as a guide to unpacking the standards. I also appreciated the suggestions around looking at the historical archive of teacher practice and student achievement as a precursor guide to implementing the CCSS. Common to both this text and Understanding by Design is a push to spiral skills across the grades. This approach offers the focus on depth that the Common Core (and others) call for while increasing levels of sophistication in understanding and application as students are scaffold in their development across time and even content areas. In my blog entry titled Mapping the Past, Mapping the Future I discuss in greater detail some of the recommended steps to create a long-term plan for curricular reform; with an emphasis on engaging all teachers in a process that is in a constant state of striving towards improvement through self-assessment. Perhaps the greatest wealth of research-based learning I interacted with this quarter is the various readings from Curriculum Leadership Readings for Developing Quality Educational Programs edited by Parkay, Hass and Anctil (2010). My initial class discussion post explored the rewards and difficulties of teacher leadership raised by Ackerman and Mackenzie (2010). This reading gave me an opportunity to reflect on my past role (or non-role) as a teacher leader and where I’m inspired to go in the future. In retrospect, I can see that choosing not to actively voice my opinion influences school curriculum in ways as important as the most vocal staff member. By remaining silent in my early days, I was complicit in decisions whether I agreed or not. Like politics, by choosing not to choose, I chose; there is no remaining “neutral”. I couldn’t help but notice the irony when reading about the progressive educationist William Heard Kilpatrick’s call for matching curriculum to student interest with project based assessment that leads towards “intelligent thinking and not mere habit” (p. 38). I’m impressed with how current Kilpatrick’s educational thought was coming from someone born one hundred and thirty-eight years ago. I also found my readings to be particularly useful this past week during an on-site interview at an international school in West Africa. I found myself in an interview with the school’s current elementary- middle school principal as we discussed my teaching background and educational philosophy. I was able to draw from the work of Parkay, Hass & Anctil (2010) in their writing about Middle Level Curricula; they assert (and I agree) that middle school should be a place where students transition from elementary to high school in a supportive environment that is responsive to the unique emotional and physical needs of these students yet is not a “watered down” version of high school. It was affirming that I could draw on and give voice to my development as an educator during an informal job interview. As I wrap up my thinking and reflection on the work I’ve accomplished and the work still to be done, I am left with a sense of great accomplishment yet lingering dissatisfaction. I believe that I have worked hard to apply what I’ve learned this quarter to previous and newly developed projects. I clearly have a more sophisticated understanding of understanding and the intersection between design and standards based assessment. I am not nearly as intimidated by the thought of creating a middle school language arts curriculum Grades 6 through 8 replete with standards based assessment, rubrics and a spiraled curriculum; it would take much work and collaboration but it is doable. I believe the glaring deficiency in my final project is a lack of professional feedback. I have asked a curriculum consultant friend to take a look at my final project and she has, commenting, ” I like the write-ups and the concepts maps and the activities and instruction seems sound”. However, I feel that a more detailed and critical analysis would help move my project to the next level. My project clearly lacks a collaborative and multi-perspective voice as well; I worked in isolation more out of necessity than any other reason. A difficult aspect of pursuing an M. Ed when I am not teaching in a school is lack of real-time collegial feedback and support. I look forward to returning to a school setting soon! I am left wanting more experience working at the truly macro level of curriculum development, a level where I am able to collaborate on creating a curricular map from KG through grade 12 for one content area, then expanding that to include an understanding of how an entire middle school program, for example, would be mapped-out. I suppose this is outside of the scope of this course, and my developmental level at this point, but this is where my brain and motivation naturally leads me to, asking “what’s next?”. In all actuality, this is probably the work that is to be done in the district office and something that I will not experience until I engage in my year-long program director internship, but I am eager to expand my skills. Despite longing for that next level of understanding, I value the scaffolding of my skills as I move through the Curriculum & Instruction (soon to be Teacher Leadership) program at SPU. What a difference a year has made. Ackerman, Richard & Mackenzie, Sarah V. (2010). Uncovering Teacher Leadership. In Forrest W. Parkay, Glenn Hass &, Eric J. Ancil (Eds). Curriculum Leadership: Readings for Developing Quality Educational Programs Ninth Edition (pp. 15-20). New York: Pearson. Glatthorn, Allan A., & Jailall, Jerry M. (2009). The Principal as Curriculum Leader Shaping What is Taught and Tested. California: Corwin Press. Jacobs, Heidi Hayes. (2004). Getting Results with Curriculum Mapping. Alexandria, VA: Association for Supervision and Curriculum Development. Kilpatrick, William Heard. (2010). The Case for Progressivism in Education. In Forrest W. Parkay, Glenn Hass &, Eric J. Ancil (Eds). Curriculum Leadership: Readings for Developing Quality Educational Programs Ninth Edition (pp. 36-39). New York: Pearson. This entry was posted in EDU 6524 Curriculum Design, Standard 01. Instructional Planning, Standard 03. Curriculum and tagged big ideas, curriculum design, curriculum mapping, Grade 8 ELA, job shadow, Meta Reflection, middle school curriculum, principal as curriculum leader, self-reflection, UbD, Understanding by Design, understanding understanding. Bookmark the permalink. How great that you could use the middle level information during the interview… you do have a great handle on this material!